Whether you have a bumper crop in your garden or decided to buy in bulk, roasting and pressure canning chile peppers is a great way to preserve them. Home canned chile peppers are handy to have available to add to your favorite chilies and Mexican inspired meals. The jars can be stored on dark pantry shelves, so they don’t take up a lot of space in the refrigerator or freezer. Any type of pepper can be pressure canned with this method, including Anaheim, New Mexico, jalapeño, poblano, and Serrano. Feel free to mix and match peppers. I use mostly Anaheim peppers for canning and like to include one jalapeño in each jar to add a little heat. This seems to work well for our favorite recipes. Use a Pressure Canner: Plain peppers are a low acid food and can only be canned safely using a pressure canner. Pressure canners processes at a high temperature necessary to eliminate the risk of food borne bacteria. This cannot be achieved with a water bath canner. One of the first investments I made when I began gardening was this Presto 16-Quart Aluminum Pressure Canner. It has served me very well for preserving low acid foods such as carrots, beans, and other harvests. It works in my small kitchen, and I can lift a full canner load off the stove without help. 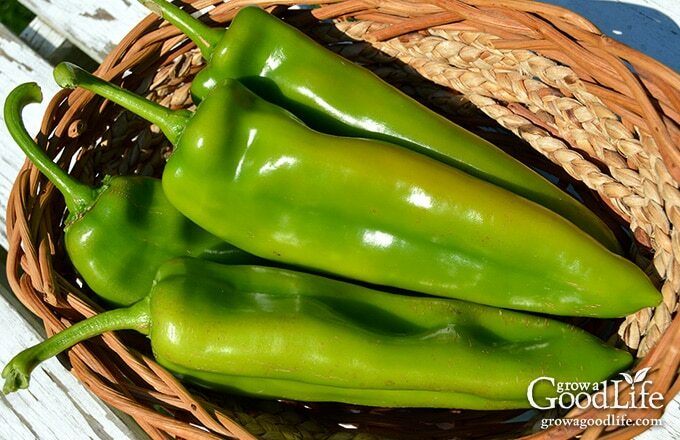 Select Healthy Peppers: Choose fresh, bright green, and firm chile peppers with no blemishes, soft spots, or bruises. Plan on about a pound of peppers per pint jar, or half a pound per half-pint jar. Wear Gloves: Wear gloves when handling hot chile peppers and avoid contact with your skin and eyes. 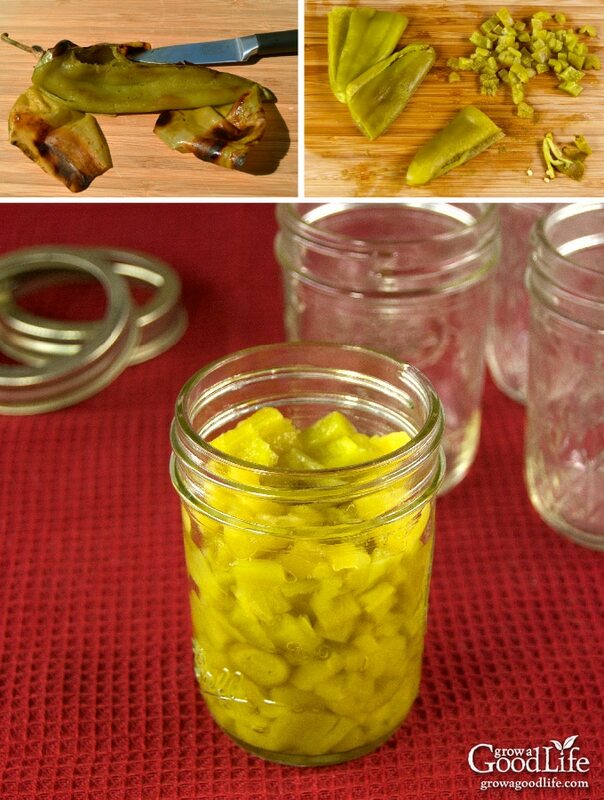 Remove Skins: Anaheim, Hatch, Poblano, and New Mexico type chile peppers have a tough outer skin that should be removed before canning. The skin can taste bitter, add unwanted texture, and is difficult for some to digest. Thin-skinned peppers, such as jalapeño and Serrano can be canned without removing skin. Plus basic kitchen supplies such as a knife, cutting board, large pot, large bowl, small pot, and clean kitchen towels. 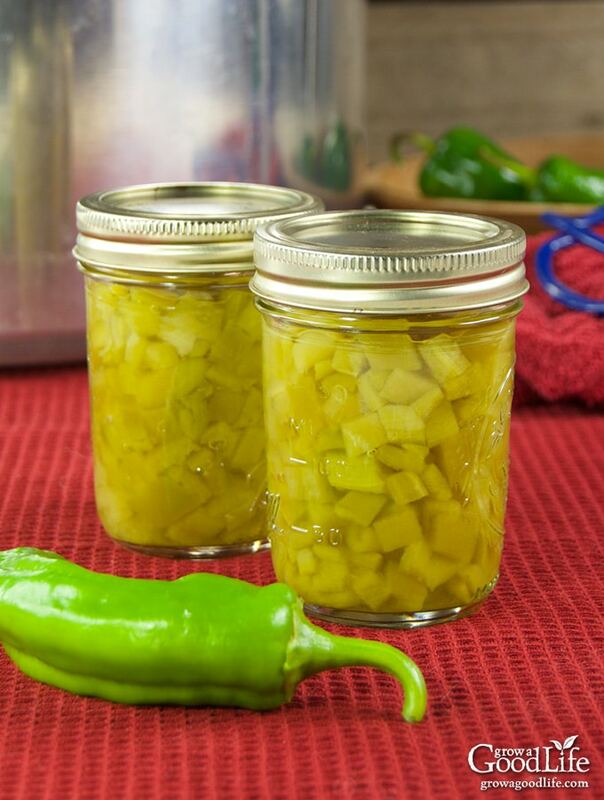 Home canned diced green chile peppers are handy to have available to add to your favorite chilies and Mexican inspired meals. Wash your jars and lids in warm, soapy water and rinse thoroughly. Place the jar rack into the pressure canner, set the clean jars in the canner, add water to the jars, and fill the canner to around 3-inches. Turn the heat to high and boil jars for 10 minutes to sterilize. Keep the jars warm until ready to use. Add lids to a small pot over low heat to soften the seal. Fill a large pot with fresh, clean water and bring to a boil. Rinse your chile peppers with plain water and place on a kitchen towel to air dry. Blister the skins of your peppers by grilling or broiling until the skins crack and separate from the flesh. Remove the peppers from the heat and place in a covered glass bowl to steam. See How to Roast and Peel Peppers for step by step tutorial. When the peppers are cool enough to handle, put on your gloves and remove the skins, stems, seeds, and membrane. Chiles can be cut in pieces or left whole. Cut into 1/4-inch pieces for diced green chile peppers. Spread a kitchen towel on your counter. Use the jar lifter to remove the warm jars from the canner and line up on the towel. 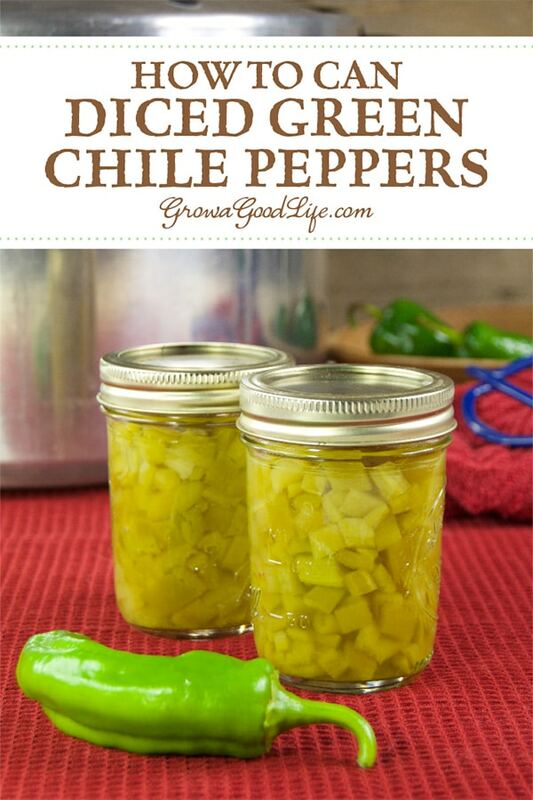 Use your canning funnel and raw pack the diced chile peppers loosely into the jars. Leave a 1-inch headspace. If you are using canning salt, add 1/4 teaspoon per pint jar. Ladle hot water over the chile peppers and fill the jar maintaining the 1-inch headspace. Run your bubble popper through the jar to remove air bubbles, and wipe the rim of the jar. Use your magnetic lid lifter to lift lids out of the warm water, center lid on jar, and screw on band until it is fingertip tight. Use your jar lifter to place the jars back into the pressure canner. Once all the jars are in the canner, adjust the water level per your pressure canner’s instructions, 3-inches for most canners. If adding water, use the hot water from your large pot. Close the pressure canner and secure the lid. Leave the vent open, adjust the heat to medium-high, and bring the canner to a boil. Allow the pressure canner to vent for 10 minutes, and then place weight on the vent. Once the pressure reaches 10 pounds, process for 35 minutes at altitudes of less than 1,000 ft. Follow the directions for your pressure canner and adjust processing time for your altitude if necessary. When processing time is complete, turn off the heat and let the pressure canner cool down naturally (approximately 1 hour). Once the pressure canner has cooled, spread a kitchen towel on the counter, unlock cover, and remove it by tilting lid away from you so that steam does not burn your face. Allow a few minutes for the jars to adjust to the change in pressure. Use your jar lifter to remove the jars from canner and place them on the towel. Allow the jars to cool for 12 to 24-hours. You should hear the satisfactory “ping” of the jar lids sealing. After 12 to 24-hours, check to be sure jar lids have sealed by pushing on the center of each lid. The lid should not pop up. If the lid flexes up and down when center is pressed, it did not seal. Refrigerate jar and use it within a few days. Remove the screw on bands and wash the jars. Label and date the jars, and store in a cool, dark place. Use within 12 months. Yields 12 half-pints. Use your canned diced chile peppers in place of canned chile peppers in your favorite recipe. You will find that home canned chile peppers in jars taste so much better than store-bought canned peppers. If all you have is a water bath canner, there are safe canning recipes that you can use to preserve peppers. 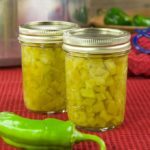 These recipes combine peppers with other ingredients to alter the acidity enough to make them safe for water bath canning. Jill, Go ahead and include the liquid unless the recipe specifically says to drain the liquid. It is infused with chile pepper flavor. MUST TRY THIS. i LOVE THEM. Thanks for sharing. So timely! Have some pablanos and a few jalapenos and been wondering how to pressure can them. Now I am motivated! Thanks!